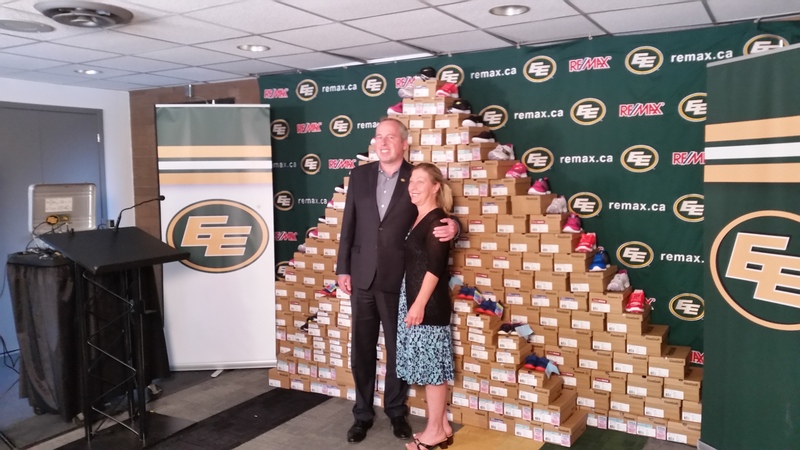 Today, Eskimos President and CEO Len Rhodes, in partnership with the adidas Group, donated 300 pairs of shoes to the Edmonton Women’s Shelter. The donation has personal significance to Rhodes. During today’s announcement, he shared his personal story of witnessing his late father abuse his mother while under the influence of alcohol. Edmonton Women’s Shelter, commonly known as WIN House, is a non-profit agency operating three shelters. The WIN Houses are open 24-hours-a-day, 365 days-a-year for women with or without children escaping situations of abuse and violence. This marks the fourth donation by the Eskimos in partnership with the adidas Group. Nearly 1,300 shoes have been donated to date for women and children fleeing domestic violence. Last month, Rhodes participated in the CFL’s announcement of a violence against women policy. The policy was developed in partnership with the Ending Violence Association of Canada and following consultations with multiple women who are experts in the field of responding to violence against women. These experts work regularly with CFL teams to deliver outreach and public education programs.